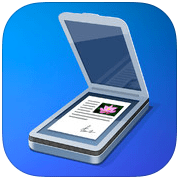 Scanner Pro is a $6.99 app that is currently Free in the iTunes store. This is one of those handy utility apps ever teacher/student needs. Scanner pro lets uses an iOS device’s camera to scan documents, complete with real-time border detection for perfectly-sized scans, and stores them as PDFs in a variety of cloud services, including iCloud and Google Drive. Great app for scanning writing, artwork, or other paper based student projects. The app has the ability to send the scan as a fax through an in-app purchase. Grab it while it is free and let us know how you are using it in your classroom.